The 300-foot-long Soviet Lun-class Ekranoplane was once thought to be a potential revolutionary transport vessel, capable of being faster than any ship and bigger than any plane. Through an effect generated by its wings, the Ekranoplane could fly fly as close as four meters above water or land. Not to mention, this beast of a vehicle was more than capable of carrying nuclear warheads! 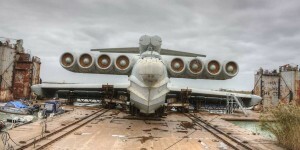 Despite all its unique features and multipurpose functionality, the Ekranoplane was never used in action as it was never entered mass production.